Service your equipment with us. Keep your tractor running in top working order. Whether you are looking for routine maintenance or a heavy repair, we do it all. In fact, we have experienced, factory-trained technicians that get you back to work fast. Furthermore, our professionals are ready to keep your investment running in peak condition. 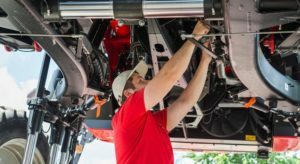 Contact us today to have our qualified technicians assess your tractor’s current condition. You can then decide on a maintenance plan that best meets your budget and needs. Stop by or call us to discuss any of your parts and service needs today.